I am happy to be back in El Salvador. This small Central American nation is tightly wedged against the Pacific by neighboring Guatemala and Honduras. The Spanish conquistador Pedro de Alvarado is credited with naming the region Provincia De Nuestro Señor Jesus Cristo, El Salvador Del Mundo — translated “Province of our Lord Jesus Christ, the Savior of the World.” The name of the country was later abbreviated to El Salvador or “The Savior.” The country remained under Spanish control until 1821 when it declared its independence from Spain. El Salvador is a beautiful country and its people are among the friendliest I have ever met on my travels around the globe. Our team of volunteers from Kingsland Baptist Church is here to drill a water well in cooperation with Living Water International. This will be the fifth water well we have sponsored and helped to drill. We will leave early in the morning for the village of Las Tablas, a community of 25 families in need of clean water. As I write this post, our hygiene training team is preparing for their first day of teaching the women and children in the village about how germs are spread and other health-related topics that will help them to adopt practices that can lead to healthier living. Our team will also teach the women how to use, care for, and maintain their new water well. The location of this well will help these villagers to spend less time fetching water, time that they can reinvest in their families. Soon after we arrived, several of us walked to the Pacific Ocean, less than fifty yards from where we are staying this week. I love this particular location because there is a statue of Christ on a jetty of volcanic rock made smooth by the constant motion of the waves. 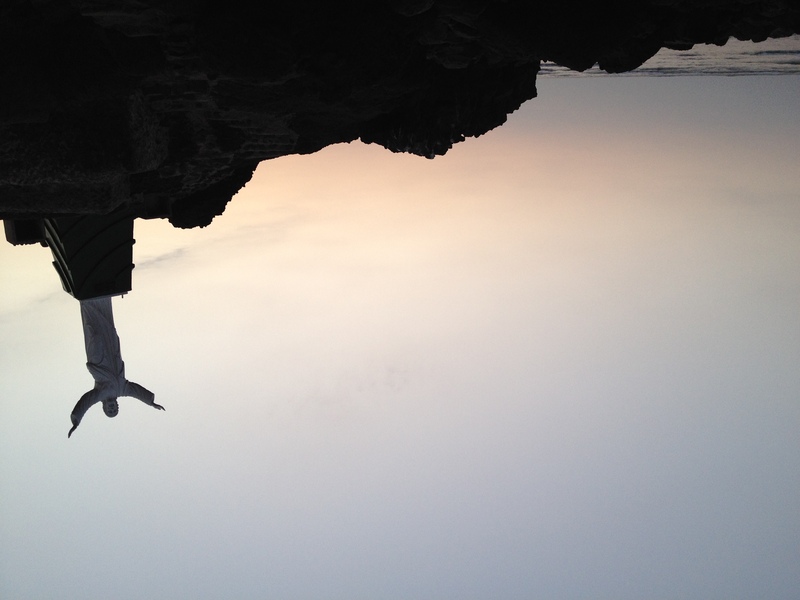 Christ stands looking back toward the mainland with His arms extended. As I stood at that spot and looked back toward El Salvador, I could not help but reflect on the fact that Jesus loves the nations and so should we. And I thought it appropriate that Jesus stood above the breakers. Waves are often used as a metaphor for the stuff of life that can beat us down. That statue of Jesus standing above the waves is a reminder that He cares. The inscription on the plaque at the base of this statue reads: “y camino sobre las aguas para salvarnos…” which translated means, “and He walked on the surface of the waters to save us.” And indeed He does. This week our team will be the hands and feet of Jesus among the people of Las Tablas. We will extend our arms to embrace them and to love them in the name of Jesus, El Salvador. We will spend the morning visiting in their homes and then begin the drilling process after lunch. We will eat our meals in their homes and get to know these families. We hope our presence encourages them and that the well that we drill will bless them for years to come and remind them of Jesus, the One who alone can supply us with living water and quench our deepest thirst. I’m so excited to read of your adventures this week in El Salvador, Omar. You are indeed the hands and feet of Jesus, offering a drink of living water to the people of Las Tablas. May they see Jesus in you and in the well the team will leave behind. Hugs to the team from Mark, Nicholas, and me! Thanks, Jill. So glad to be here. I will pass your greetings along to the team. Proud to be with you on this journey Brother!!! Thanks for your leadership of the Agua Viva El Salvador team. We always look forward to serving with you and your team. I am soo excited for this as I am also going to El Salvador in the September trip with brother Jim Coleman. I am from there and have not been back in 14 or 15 yrs. I am so happy to have this privilege to go and help out. I have had this call for 2yrs. and finally I will have the opportunity to go!! I am praying for this mission so God can manifest in different ways. You will love the trip to El Salvador, Patty. I am really glad that you will join our September team to drill another water well and tO teach the people about good hygiene. Thanks for praying for our team.